The October Meeting of the W.C.T.U. met at the home of C.S. George Oct 19, 1926. Miss Belle [illegible] was leader The meeting was opened with song; "Onward Christian Soldiers" The scripture was a part of the 2nd Chapter of Ephe. read by Miss Brownell Mr. W.G. Ray gave a very instructive talk on Prohibition in [illegible] The secretary's report was read and accepted The committees report on closing of the Sunday movies was held over. Over six hundred was received. It was moved and sec. That five hundred more blotters be sent for for November. It was also moved and seconded that the temperance literature be sent for for temperance Sunday. Mrs Robt Lincoln, Mrs ME Hess, Mrs E Stacks and Mrs Anna [illegible] were chosen as delegates to the State Convention at Mason City Oct 26-29th 1926. Mrs W.S. Kearney read a very interesting report of the W.C.T.U. National Convention held at Los Angeles Sept. 28th to Oct 4th 1926. 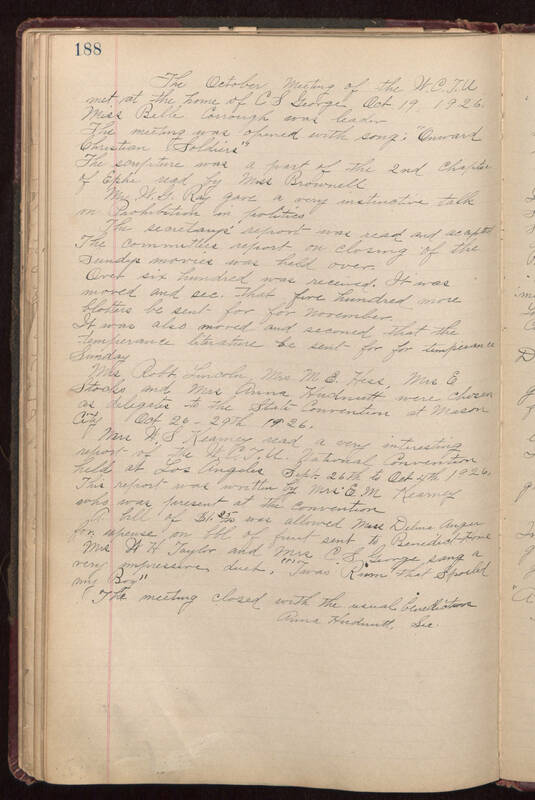 This report was written by Mrs E.M. Kearney who was present at the convention A bill of $1.25 was allowed Miss Delma Anger for expense on [illegible] of [illegible] sent to Benedict Home Mrs AH Taylor and Mrs CS George sang a very impressive duet, "Twas Rum that Spoiled my Boy" The meeting closed with the usual benediction Anna [illegible], Sec.